Thank you for hosting Carol. Love the fact that you are reading and sharing a verse novel with an historical perspective. I am trying to write one myself at present. Lots of background research required in order to maintain accuracy.I might to read this one you refer to. Thanks for the alert. Today I am thinking about SOUND in poetry. Sounds like another fabulous verse novel to check out. You've featured several great ones recently! Happy Thanksgiving recovery! I'm still feeling a little overstuffed. Thanks for hosting, and for telling us about this book. I hadn't heard of it before. My Poetry Friday post wraps up our TeachingAuthors Three Weeks of Thanks-Giving with a tribute to Katherine Paterson and includes a poem from her beautiful book Giving Thanks: Poems, Prayers, and Praise Songs of Thanksgiving. Carol, Thanks so much for hosting. I love hearing about this new book. I've loved Ann E.Burg's All the Broken Pieces. So, I look forward to this title. I'm a transplant to VA. I enjoy learning about this state. This book sounds like something I'd love. Thanks for hosting, Carol. And Happy Thanksgiving! Hello, Carol! Thank you so much for hosting. Haven't heard of this title yet, so will definitely try to find in our library. Here is my Poetry Friday offering today: a bit of Isol and O'Shaugnessy. Thank you for hosting today, Carol! 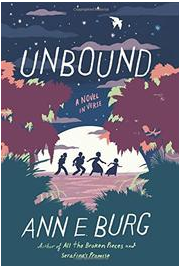 I got an ARC of Unbound at ILA last summer and loved it. Like you and Linda, I hadn't heard of The Great Dismal Swamp either. Today I'm sharing a series of haiku inspired by the moon. Thanks for hosting and for this great post. I look forward to reading that book one day. My post is an ode to a tiny thing: https://friendlyfairytales.com/2016/11/23/dragonfly-ode/ in thanks for Thanksgiving. I hope you're enjoying your Cybils gig, Carol--I loved being a Round 2 judge last year and enjoying the verse novels that were sent our way. Are they separate from poetry collections this year, or is everything still together? I have words of gratitude written to go with a traditional hymn tune that I sang to my children when they were younger. They remind me of blessings worth protecting. Thanks so much for hosting, Carol and for sharing this book in verse. I can't' wait to check it out. My poem this week was inspired by a flash of color and movement outside my kitchen window. Thanks for hosting, Carol. I know you're enjoying all those novels-in-verse. Thanks for hosting! I have an original poem this week: http://thereisnosuchthingasagodforsakentown.blogspot.com/2016/11/poetry-friday-endings.html Happy Day After Thanksgiving! I've shared thoughtful songs every Friday this month. Today, I'm offering Integrity Blues by Jimmy Eat World. http://slayground.livejournal.com/842452.html "It's all what you do when no one is there."